The Ford Ranchero was made from 1957 until 1979. This vehicle was very unique when it was introduced because it was the first auto that had a truck bed. The car line was modified five times with many body design changes. From 1957 to 1959, this auto was basically patterned after the full-size Fairlane and featured all of Ford's engine options such as the 352 special V-8 engine. Most had two-tone paint, along with interior trim options. From 1960 until 1966, the body style was modeled after the Falcon's design. It was more compact in size and offered the V-6 or 260 v-8 engine. The 1964-1966 Ranchero had the new Falcon design and also had all of the Falcon's performance upgrades such as the 289 V-8 engine. In 1967, the body had the Fairlane's body style and had a 390-4v engine option. From 1972 - 1976, this car had the Torino body style and was equipped with the C6, Hurst 4 speed or FMX automatic transmission. 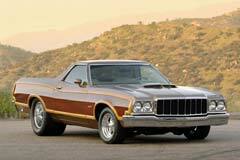 In 1977, the Rancheros had the Thunderbird/LTD body design and three models were available the GT, 500 and standard. The final year for this car offered a limited, special edition "1979 ½" model and it had an all-leather interior and special paint color. The Ranchero's unique design has makes them highly collectible.